Back in high school during the early 1990s, I started reading Tom Clancy's novels, and continued to do so into college, where I finally stopped when I tried reading The Bear and The Dragon, which was so gigantic a novel and so deeply entrenched in Clancy's fantasy universe (because by the time Clear and Present Danger came along, the series was no longer a "might be happening right now" and in the realm of pure speculative fiction) that I just had no interest, especially since this was right around 9/11 (aka, sixteen years ago). I haven't gone back to read any Clancy since then, but I found myself iin the mood after visiting Battleship Cove in southern Massachusetts, where they have the USS Massachusetts, as well as a destroyer, a submarine, and an East German missile frigate. There will be spoilers ahead, since THFRO was published over thirty years ago, and the movie came out over a quarter-century ago. If you cared that much about spoilers for either, you'd have read/watched them by now. Also, I'm not going to write a synopsis - that's what Wikipedia is for. First off, I love the THFRO movie. It has a great score, great acting by everyone, some excellent submarine combat scenes, and just an all-round great "techno-thriller" feel. I think that term, "techno-thriller" gets thrown around way too much lately, but THFRO is really one of the first novels to define the genre, and while the movie demonstrates some of the elements, it is in the novel where the elements of the Techno-Thriller really shine, because so much of the book's detail comes in not only Clancy's passion for technical precision, but in now military technology - both intelligence gathering tech and combat tech - plays a crucial role in the story. There's a whole scene around an Alfa-class Russian submarine suffering a reactor incident that, while extremely technically dense, creates a sense of impending dread in the reader as each aspect of the reactor failure is detailed, culminating in the fatal sinking of the submarine. While not everyone enjoys that level of detail, you have to admit that Clancy was very good at laying the details out and using them to ratchet up the tension of the story. I've probably watched the movie ten times, but as this was the first time in probably 25 years I've re-read the novel, I was impressed with how much of the book has nothing to do with Ramius and Ryan. A lot more of the novel is given over to the standoff between the US and Soviet naval forces, something that is just touched upon in the movie where a Tomcat collides with a Russian plane and makes a crash landing on the carrier's flight deck. The novel really does a great job of showing the vast scope of the operation, from both sides. Speaking of the opposing side, we have to discuss Captain Tupolev. In the novel, Tupolev is a former student of Ramius', but he goes after his old mentor out of duty, not some insane, bug-eyed obsession. Stellan Skarsgard was fine in his role, even if it was fairly limited, but the movie's Tupolev was a sweat-sheened, chain-smoking madman who would risk a reactor incident in order to catch and sink Ramius. 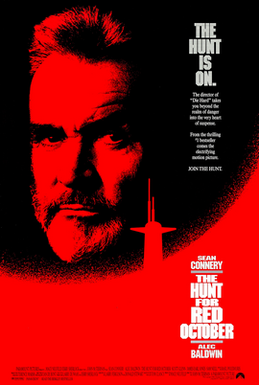 The novel's Tupolev, at the end of the story, stumbles across Red October by accident, thinking it is an American Ohio-class missile submarine. You cheer Tupolev's death when you watch the movie, but I was actually sad to see him die in the novel, because it is clear he's rather conflicted, especially as in the novel, the submarine duel is three against one, no two against one as it is in the movie. In the movie, the fight with the saboteur takes place during the submarine battle, while they are separated by a couple of days in the novel. Ryan is also described in somewhat more unflattering terms in the book, a wealthy desk jockey with a bit of a paunch who was a second lieutenant in the Marines for three months (years in the movie) before being injured. Interestingly, the events that take place in PATRIOT GAMES are mentioned in brief in the novel, but not in the movie, which is interesting. I wonder as to the reason Clancy included that little side-note at all, unless he was already writing PG when finishing THFRO and decided to slip it in at the last minute. In the novel, neither Jim Greer or Sonarman Jones are mentioned as being African-American. I think it was great that Hollywood (in a rare display) diversified the cast a little in picking two actors of color for those roles. Interestingly, though, there was a black submarine officer aboard the Dallas, who disappears (or isn't cast as such, I can't keep track of all those characters). So, the balance is really more like +1, instead of +2. It's amazing how much of the novel gets cut away in order to make the movie. And the movie moves at a truly break-neck (no pun intended...) pace. There's also almost countless POV shifts, something that is a Clancy trademark in most of his novels, and something that many thriller readers and critics I know dislike - they prefer the story stick to the POV of just one character. As popular as he was, Clancy's stories and his writing style were not designed for the "average reader" in mind. You had to be able to keep track of many characters and be able to read, comprehend, and follow along with a lot of dense technical information. Also, for a story that deals with so much cutting-edge technology, and still reads well 30+ years later, I did have to chuckle a bit when they start talking about computers, because their specs seem so antiquated now (I looked up the Cray-2 supercomputer that gets used in the novel - a 2012-era iPad is more powerful than the Cray-2). This isn't a fault of Clancy, of course, so much as it is a sign of just how far computing has come since the early 1980s. Anyway, that's enough for now. Please feel free to leave any comments, and we can keep the discussion going!